The Breville Boss Super Blender BBL910XL has a low profile design, making it easier to fit under cabinets on your countertop. The Breville Boss is a powerful home blending machine with 1,500 Watts of power with 2 HP motor and a long 7 year warranty. Breville machines are among the most powerful that we have reviewed. This model has performance comparable to Vitamix and Blendtec machines. These type of countertop blenders are perfect for making smoothies without grit, even green smoothies with Kale and Spinach. Its High-velocity ProKinetix blade spins at high speed to cut, crush, puree and blend your ingredients thoroughly. This power can also make steaming hot soups, right in the blender. Included is a generous low profile 68 ounce BPA-free Tritan container for blending a variety of ingredients. It is a perfect size for family meals and entertaining. The lid has an opening with lid to add ingredients, and is designed to vent steam and prevent splatter. A Frozen fruit tamper is included to push down ingredients. Breville Boss Blender Features: The Breville Boss 1500 watt blender has Pre-programmed settings to automatically handle Smoothie, Green Smoothie, Frozen Dessert, Soup, and Crush Ice/Pulse. One of our favorite features is the Variable Speed Control Dial which allows you to adjust the speed for just the right amount of power. You also have a Pulse button for quick manual blending, or cleaning. Dedicated Auto Clean Function: Will easily clean around blades. 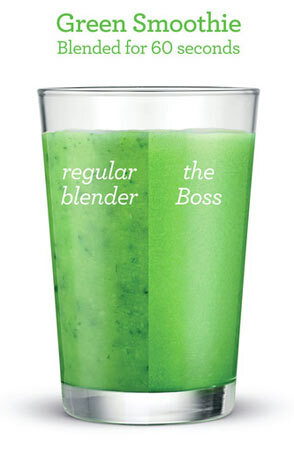 You will receive Blending with the Boss™ Appliance Science & Recipes Book. Breville Warranty: 7 year Limited Warranty. What’s in the Box? : Breville Boss BBL910XL blender, Frozen Dessert Tamper, 68oz Container, Recipe Cookbook. Smart-Review Commentary: The Breville brand has an excellent reputation. The Breville Boss Super Blender maintains this tradition. The BBL910XL model is very powerful, with 1,500 watts, and built with quality materials. A really useful feature is the Variable Speed Control Dial, which allows you to finely tune your power. 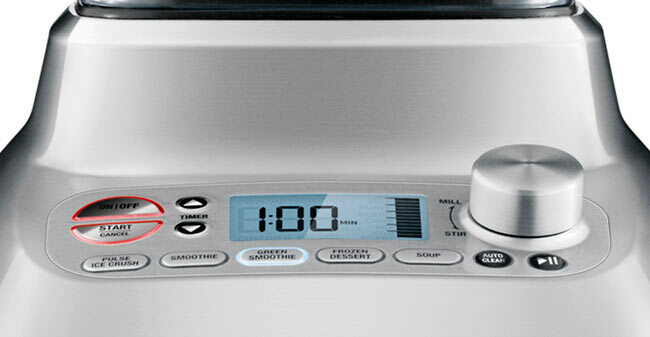 The Breville Boss also includes 5 Pre-programmed and timed settings for Smoothies, Soup and Dips. This model comes with a generous 68oz BPA-free container. One feature we really like is the timed function, you set it and it will automatically turn off when done. The Dedicated cleaning function makes for easy and fast cleanup. The BBL910XL model has received outstanding consumer and professional reviews for a countertop blender in its price range, and compares favorably to Vitamix and Blendtec blenders, and has a long 7 year warranty. This Breville model is not only a Smart-Review top pick but also won our Best of 2017 award for Blenders under $400.